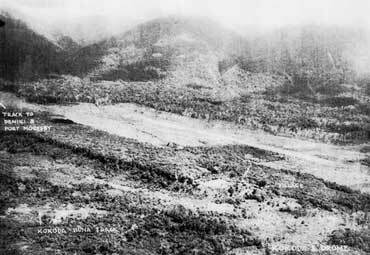 Battalion, with his B Company in action north of Kokoda arranged for an additional platoon to be flown into the airstrip in late July, but at that stage no other planes were available to bring in further reinforcements. Before more air landings could be arranged, Lieutenant Colonel Owen gave up Kokoda without a fight when, on hearing news on 27 July that his company at Oivi had been overrun, he decided to withdraw his tiny force to Deniki, some 8 km southwards along the track. 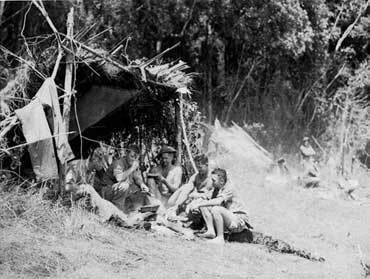 At Deniki he gathered the company that had been at Oivi and, on learning the Japanese had not yet occupied Kokoda, returned there on 28 July with his force of about 80 men. The Japanese attacked in the early hours of 29 July and Owen, in the front line while throwing grenades, was fatally wounded. Major Watson took command and although the force had sustained only light casualties it was hard pressed and forced to withdraw again to Deniki. There the remaining companies joined the battalion until by 6 August, with elements of the Papuan Infantry Battalion, the force numbered some 500. On 4 August Major Alan Cameron, the Brigade Major of the 30th Brigade, assumed command of the battalion which he intended to use in an attack to regain Kokoda. Advancing on several approaches, the attack began on the morning of 8 August. The main force then struck the Japanese before it reached Kokoda halting its advance. However, Captain Noel Symington’s company on a more westerly route entered Kokoda unopposed. Later that day the Japanese counter-attacked Captain Symington’s force which was forced to withdraw the following day. Australian forces did not return for almost three months. During the counter-offensive the troops of the 7th Division fought a number of major battles in the mountains before they reached Kokoda which they found the Japanese had abandoned without a fight. On the morning of 2 November, Lieutenant A.N. Black’s platoon of the 2/31st Battalion entered the village, and Brigadier Eather of the 25th Brigade established his advanced headquarters there in the afternoon. Just after midday on 3 November Major General Vasey hoisted the Australian flag at Kokoda before a small parade of Australian soldiers. Soon small quantities of supplies and ammunition were being flown into the airstrip. On 5 November the Corps commander, Lieutenant General E.F.Herring, flew into Kokoda to give orders for the advance, and the next day, Major General Vasey presented medals to some of the Papuan carriers and thanked them for their assistance during the advance. 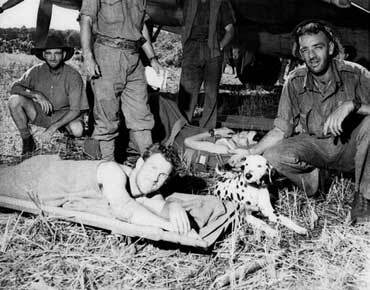 For a while Kokoda was the main point for supply and evacuation of casualties before further airfields came into operation as the army advanced.